Informing members and fellow industry professionals on agronomic practices at the home of the TOUR Championship. Pitch canker can infect a susceptible host at any point in the tree's life cycle: flower, seed, seedling, and mature tree. The fungus can also infect many different parts of hosts, including shoots, branches, cones, seeds, stems, and exposed roots. 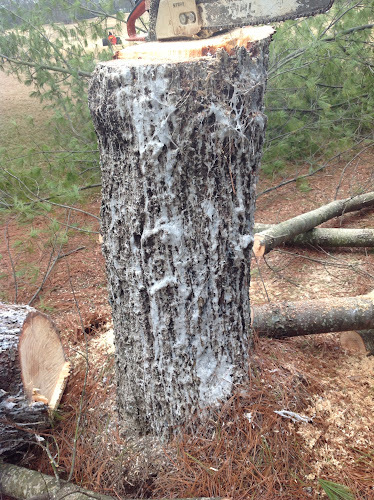 Pitch canker is easily spread from tree to tree, and the best way to stop the spread is to remove infected trees. The symptoms of pitch canker can vary among different hosts and the environments in which they are grown. In southern pines, pitch canker is often detected in mature trees by "flagging," which occurs most frequently from late fall through spring . Flagging is dieback of lateral or terminal shoots in which, the needles turn reddish-brown and are easily distinguished from the contrasting live, green needles . The infected shoots usually die within a few months due to the fungus girdling the shoot. The wood of the infected shoots becomes impregnated with resin, which can also cover the outside of the infected shoots . The amount of resin both inside the wood and on the surface of the shoot varies among pine species. The large amount of resin on the surfaces of infected shoots will frequently cement the dead needles to the dead shoot, where they can remain for over a year . During this time, the needles turn from bright reddish-brown to brown, and then to grey.